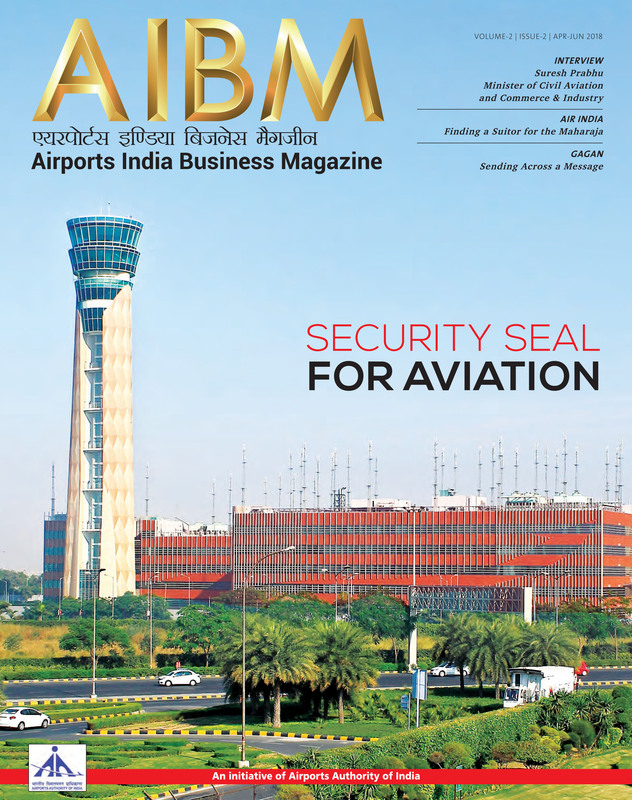 State-run Airports Authority of India (AAI) adopted an innovative approach to develop an integrated message service for its satellite-based navigation system GAGAN that has been operating successfully since 2015. The GPS Aided Geo Augmented Navigation (GAGAN) system is a Space Based Augmentation System (SBAS), developed jointly by the AAI and Indian Space Research Organisation (ISRO), and certified by DGCA for RNP 0.1 (enroute) operations over Indian Flight Information Region (FIR) and covering most of the Indian landmass for Approach and Vertical Guidance or APV 1 operations, with expansion capability to neighbouring FIRs. GAGAN provides a civil aeronautical navigation signal consistent with the International Civil Aviation Organisation (ICAO) Standards and Recommended Practices (SARPs) as established by the Global Navigation Satellite System (GNSS) panel. It is the fourth Space Based Augmentation System (SBAS) in the world, in addition to Wide Area Augmentation System (WAAS) from the United States (US), the European Geostationary Navigation Overlay Service (EGNOS) from Europe, and the Multifunctional Transport Satellite (MTSAT) Satellite Augmentation System (MSAS) from Japan, the third such system that has the capability of Approach with Vertical Guidance (APV), providing near precision vertical guidance to most of the runways up to Obstruction Clearance Altitude (OCA) of 250ft and the first SBAS developed for meeting the requirements for equatorial anomaly region. GAGAN is a part of Global Navigation Satellite System (GNSS), which takes the navigational aid from the core GPS (Global Positioning System) constellation and augments it through GEO stationary satellites for providing better accuracy, integrity and continuity of service for its application in civil aviation. GAGAN signals are compatible with international SBAS interoperability standards; ICAO SARPS (International Civil Aviation Organisation ‘Standards and Recommended Practices’) on GNSS and MOPS (Minimum Operational Performance Standards) established by the Radio Technical Commission for Aeronautics (RTCA). The AAI, in coordination with Indian National Centre for Ocean Information Services (INCOIS), Snow and Avalanche Study Establishment (SASE), National Disaster Management Administration (NDMA), and Indian Metrological Department (IMD), is planning to utilise GAGAN in other areas such as disaster management, precision agriculture and fisheries. To achieve this, a concept of Short Message Service (GAMES) using GAGAN is being evolved and implemented, which will provide specific, reliable alert messages to various users. 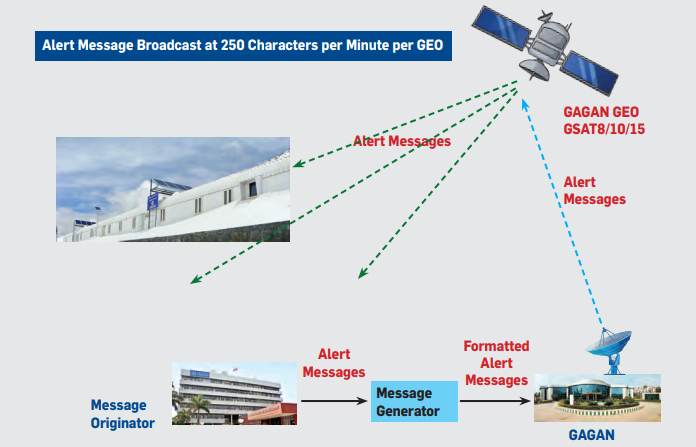 The applications of GAGAN to various users are enabled through the GAGAN messages sent through the GEO satellites (GSAT-8 and GSAT-10). Further GAGAN can be utilised for sending short service messages with suitable changes in the message structure. In this context, the availability of free bandwidth enables systems like GAGAN to broadcast additional communication messages. Early warning messages on the occurrence of natural disasters, calamities and dangers for the safety of life within GAGAN coverage area also add value to lives and goods. Search and rescue messages, relief and mitigation related messages and meteorological information are some more benefits of GAGAN. GAGAN footprint covers a vast area from South Africa to Australia and can be utilised very effectively in the Indo-Pacific region. The availability of Message Type-63 in the GAGAN system makes it possible to broadcast text messages that could be Early Warning/ Alert messages on the occurrence of natural disasters, calamities, dangers for the safety of life within GAGAN coverage area. Currently GAGAN is broadcasting Message Type-63 without any content in its data structure and it is known as ‘null message’. The message statistics of the GAGAN broadcast shows that about 13,000 ‘null messages’ (Message Type 63) are being sent every day and they are ignored by aviation users. These ‘null message’ slots can be effectively utilised to carry short text message information for providing emergency services alerts throughout the GEO footprint. Through MT63, about 250 characters per minute can be transmitted per satellite and this data would be ignored by aviation sensors but usable throughout India and the neighbouring countries by mobile phone users and anyone else with an SBAS enabled receivers which are configured to read MT-63. According to the AAI, the Integrated Message Generation System for GAGAN Message Service (GAMES) will allow users to utilise the satellite-based navigation system’s services in non-aviation sectors. Recently, the AAI entered into a MoU for the development of GAMES with Indian National Centre for Ocean Information Services, Hyderabad. Currently, advisory services like ‘Tsunami Alerts’ are disseminated through conventional terrestrial communication which has limited reach. However, GAMES is expected to overcome “the problem of last mile reaches”, since the messages can be received directly on a hand-held receiver or on a mobile phone.